In a mixing bowl, add all the ingredients (expect the ones for the tempering) . Heat the mustard oil in pan and add the fenugreek seeds and slit green chillies. Let it fry for 2-3 mins. 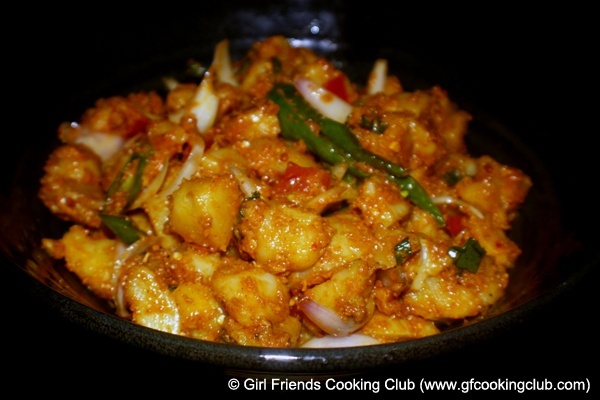 Pour the oil along with the fenugreek and chillies into the bowl with the potatoes and spices. Mix well till all the spices are nicely coated over the potatoes. Adjust the chilli and lemon according to your taste. This entry was posted in All Recipes, Nepali Food Recipes, Salads, Snacks & Appetizers, Vegetables and tagged Aloo Sandeko, Nepali Cuisine, Nepali Recipes by Kamakshi. Bookmark the permalink. I love your website and the recipes. Have also tried a few which turned out to be amazing. However I do have a request, if u could put up the measurements in lbs too! That would really be appreciated. Just a thought. Wonderful recipe…..thank you for sharing!